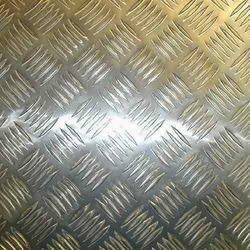 We are the leading and prominent Manufacturer and Supplier of all types of Aluminium Chequered Plates. We are offering high strength Chequered Plates to our clients is different sizes as required by them. These Chequered Plates are manufactured from high grade quality raw materials. Our plates are available to our clients at reasonable prices. Aluminum Tread Plate can be used for a wide range of construction and structural purposes; this is because of its lightweight, durable, low maintenance quality. Its non-slip element allows it to be widely used as vehicle flooring and industry flooring due to its practical and decorative function. We are one of the leading stockists, Suppliers and Exporters of Aluminium Products. Diamond plate is arranged with a regular patten of raised diamonds. These raised diamonds can create friction to provide excellent skid resistance. Diamond plate is sometimes used in machine platform.